Tango is synonymous with Buenos Aires, and no visit to the city would be complete without taking the time to enjoy this aspect of Argentine culture. Before arriving in Argentina, my exposure to tango had been minimal. Medellin hosts an annual tango festival each year, and I'd attended a free dance performance in 2009, as well as an outdoor concert in the botanical gardens in 2011. But that was it. As I was getting ready to leave Peru, I was offered the chance to experience and review one of the Buenos Aires tours offered by GetYourGuide, an online booking site that covers destinations around the world. 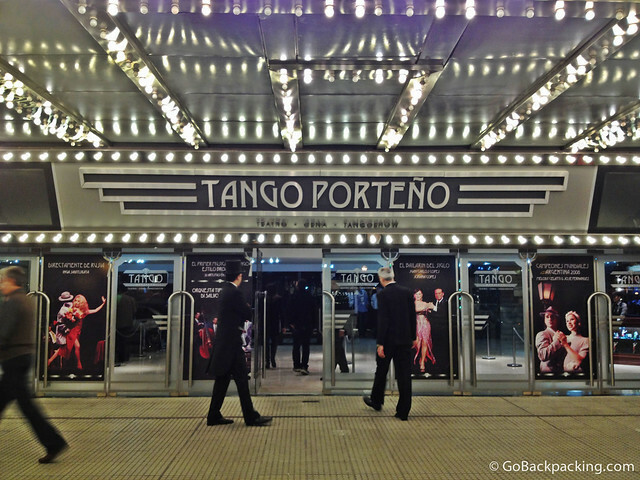 I looked through the various activities on offer in Buenos Aires, and settled on Tango Porteño, which was highlighted as a bestseller. At $141.50 per person, the price is on par with Broadway tickets. Roundtrip transportation is included in the cost of the tour, however the local operator doesn't pick up from private residences. Instead, I was given the name of the hotel nearest my apartment, and met the driver there. 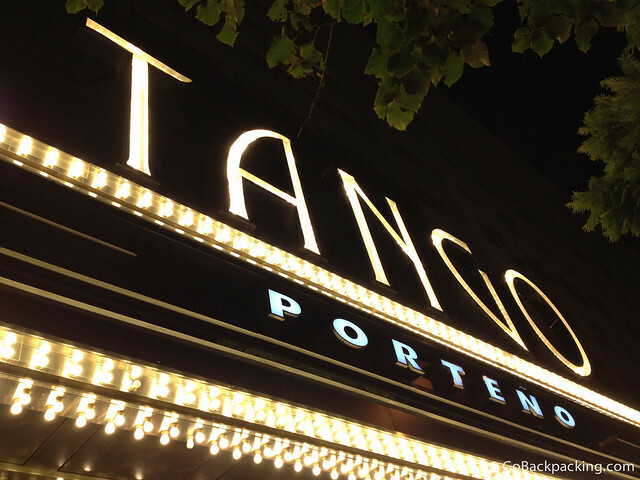 We picked up a Brazilian couple before arriving at the Tango Porteño theater, which has a marquee to rival any seen on Broadway. We have recreated the most important, unparalleled age of Tango history in our Tango Porteño. In this special place only a few steps from the famous Obelisk we have recovered the essence of a unique time and place. The setting is luxurious and is the embodiment of refined ambience; a treasured Metro Goldwyn Mayer movie theater from bygone years. The theater was restored down to te last detail in pure art-deco style and is complemented creations. The doormen and staff inside were all dressed in period costumes to help set the mood from the very beginning. It felt as if we were about to step back in time to the golden age of tango, and I was getting excited. After presenting my voucher, I was lead inside the theater, where I was seated at a table in the back. I noticed another place setting for one at the table in front of me, and four settings at the tables to my right. The tables were lined up communal style, so unless you go with a group of people, chances are you'll be sitting next to strangers. As additional people continued to arrive, I noticed a lot of women had dressed up for the occasion. I began to feel a tad self-conscious in my t-shirt, jeans, and sneakers, but given how dark it was in the theater, I didn't worry about it for long. It didn't take long for a waiter to come by and take my order. A 3-course meal, with drinks, is also included in the ticket price. I chose the potato soup, chicken for the entree, and the chocolate mouse for dessert. For beverages, it's all you can drink wine, beer, soda, or mineral water. I went with red wine for the night. Aside from the dessert, the portions were all smaller than I expected, so if you have a big appetite, I'd recommend eating beforehand, or planning to grab a bite afterwards. 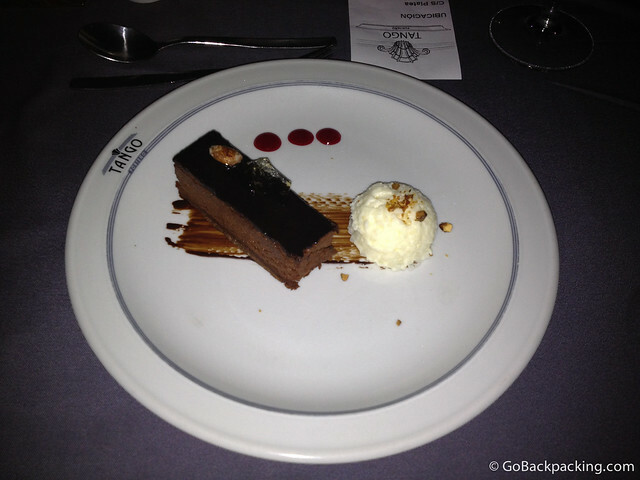 The chocolate mousse was excellent, and arrived just as the house lights were turned off, and the show got started. After all, it is the dancing, not the food, that brought us to Tango Porteño for the evening. The choreography, orchestra, costumes, and stage production were all excellent. In a hostel, I'd overheard one woman say that watching professional tango dancers was intimidating if you're just starting out yourself. If anything, I found it inspiring. I only wish the show had lasted longer than an hour and a half. The only thing that bothered me was the constant chatting of the women at the table behind me. I thought it was disrespectful to not only the performers (who obviously couldn't hear them), but to the other people seated around them. Every now and then, I'd hear “shhhhh's” break out from other parts of the theater, so I know it was happening elsewhere too, and I wasn't the only one distracted by it. I can only guess it was the addition of food and wine to the theater experience that gave people the license to be so loud. It wasn't until the last performance of the show that I'd finally leave my table, and walk down an aisle to get video close-up. 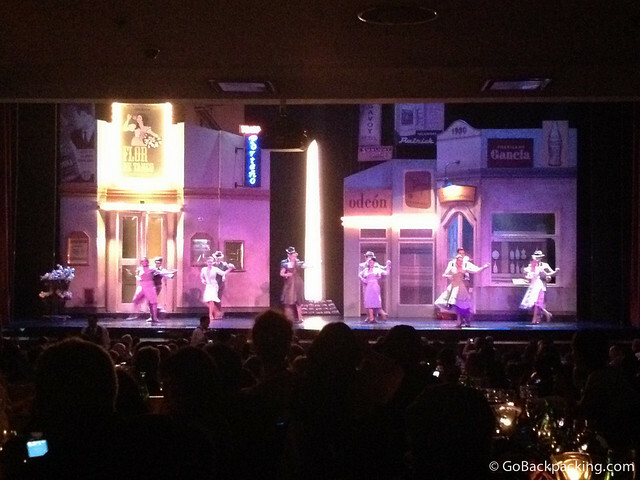 I believe there are two ways to experience tango in Buenos Aires. The first way is to learn tango by taking lessons, and spending time in the local milongas. Obviously the time, energy, and dedication required to do this will appeal to only a small percentage of visitors to the city. 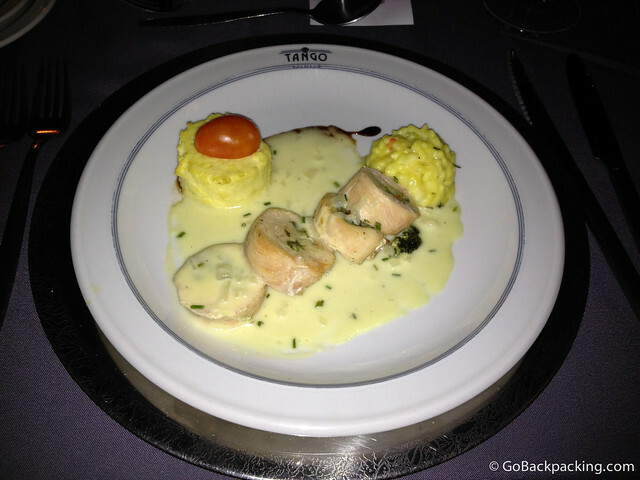 The second, easier way is to take in a dinner show like Tango Porteño. Sure, you can catch shows in other countries, but for a truly authentic experience, there's nothing like seeing one in the city where tango was born. To book this tour, or others in Buenos Aires, check out GetYourGuide. Disclaimer: I was provided with a complimentary ticket for the purpose of reviewing this tour. Visitors to BsAs should know that a tango show is a completely different experience to going to a milonga and watching the locals dance the authentic social tango of BsAs. We offer a package of Tango Experience, which includes a private lesson on the basics, and a trip to a milonga where we explain the customs and codigos and dance with the guests if they care to. The real tango has nothing to do with performing or showing off to an audience; it is between the couple and the music. People of all ages and sizes dance the tango for their own pleasure and that of their partners. A tango show is like a flashy Las Vegas stage show, which is enjoyable in its own way. Well said Cherie. You’ve outlined the difference I was alluding to toward the end of my post.